Interesting selection to spend some time swimming in Anchorage. Is it not your first time here? Tell us how it went employing the Facebook comments below or contacting us directly! 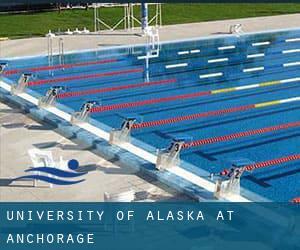 University of Alaska at Anchorage is only one of all of the swimming pools Swimia is offering you, and its information has been shared with us by a swimmer like you.Don't forget it is possible to now promote University of Alaska at Anchorage by sharing this page with your friends, adding comments and linking to us. This sports center provides 25 yards x 25 meters, 6 lanes, Indoors. For this Swimming Pool, only phone number is number here. Near Lake Otis Pkwy. and Providence Dr.
25-500 Muldoon Rd. , Anchorage , AK , USA (Postal Code: 99577). Among all the activities offered by the center, if you are enthusiastic about swimming you may enjoy Olympic size, 16 lanes, Indoors. Just in case you want to contact this Swimming Pool before dropping by, we only know the phone number. Chugiak High School , 16525 S. Birchwood Loop , Chugiak , AK , USA (Postal Code: 99577). Swimmers like you reported 25 yards x 25 meters, Indoors. Phone number and e-mail address are number for this Swimming Pool. 5201 E. Tudor Rd. , Anchorage , AK , USA (Postal Code: 99507). This sports center provides 25 yards, 6 lanes, Indoors. For this Swimming Pool, only phone number is number here. 10931 O´Malley Centre Drive , Anchorage , AK , USA (Postal Code: 99515). This sports center delivers 25 yards, 5 lanes, Indoors. For this Swimming Pool, only phone number is number here. 5353 Lake Otis Pkwy. , Midtown , Anchorage , AK , USA (Postal Code: 99507). Swimmers like you reported 25 meters, 6 lanes, Indoors. Unfortunately we do not have the email address of this Swimming Pool, but we can give you the phone number. 1700 Hillcrest Dr. , Anchorage , AK , USA (Postal Code: 99517). Swimmers like you reported 25 yards, 6 lanes, Indoors. Unfortunately we do not have the email address of this Swimming Pool, but we can give you the phone number. Updated on 2019 W. 5th at K St. , Anchorage , AK , USA (Postal Code: 99503). Among all of the activities offered by the center, if you are enthusiastic about swimming you may appreciate 17 yards, Indoors. Just in case you desire to contact this Swimming Pool before dropping by, we only know the phone number. 5577 Abbott Rd. , Anchorage , AK , USA (Postal Code: 99507). This sports center provides 25 meters, 6 lanes, Indoors. For this Pool, only phone number is number here. 800 E. Dimond Blvd. , Suite 3-030 , Anchorage , AK , USA (Postal Code: 99515). Among all the activities offered by the center, should you be interested in swimming you will get pleasure from 20 yards x 24 feet 4 inches, Indoors. Just in case you need to contact this Pool before dropping by, we only know the phone number. 4025 E. 24th Ave. , Anchorage , AK , USA (Postal Code: 99508). Among all the activities offered by the center, if you're interested in swimming you can expect to enjoy 25 yards x 25 yards, Indoors. Just in case you would like to contact this Swimming Pool before dropping by, we only know the phone number. Bldg. #690 ´D´ St. , Fort Richardson , AK , USA (Postal Code: 99505). This sports center provides 25 yards x 49 feet, 6.5 lanes, Indoors. For this Swimming Pool, only phone number is number here. Updated on 2019 1000 Arlberg Ave. , Girdwood , AK , USA (Postal Code: 99587). This sports center delivers 50 feet x 25 feet, 3.5 feet-5 feet depth, Indoors. For this Pool, only phone number is number here. 2909 W. 88th Ave. , Anchorage , AK , USA (Postal Code: 99502). Among all the activities supplied by the center, when you are interested in swimming you will take pleasure in 25 yards x 25 yards, Indoors. Just in case you desire to contact this Pool just before dropping by, we only know the phone number. Updated on 2019 4101 University Dr. , Anchorage , AK , USA (Postal Code: 99508). Swimmers like you reported 25 yards x 27 feet, 6 lanes, Indoors. Unfortunately we do not have the e-mail address of this Swimming Pool, but we can give you the phone number. 16240 Old Seward Hwy , Anchorage , AK , USA (Postal Code: 99516). This sports center delivers An Endless Pools adjustable current pool, Indoors. Contact information and facts for this Swimming Pool such as phone number and e-mail address are number.